Today's guest is the lovely Bethany Griffin. She's here to promote her exciting new book, MASQUE OF THE RED DEATH, a post-Apocalyptic reimagining of Edgar Allan Poe's horror story with the same name. Sounds cool, no? Read on to learn all about MASQUE OF THE RED DEATH and enter to win a copy of your very own, and some awesome swag from Bethany! Hello, Bethany, and welcome to Paranormal April Fools’ at Tynga’s Reviews! MASQUE OF THE RED DEATH is very different from your debut novel HANDCUFFS. How did you find switching from a present-day setting to a historical post-apocalyptic steam-punk world? I found it a fairly natural transition, in that I read all sorts of different stories. Also, sometimes it’s easier to write something totally different than to keep rehashing the same sorts of stories. I found I didn’t have another realistic story to tell, but I had a lot of other stories I wanted to try. Were there any special challenges when writing a re-imagining of another author’s work, especially one as well known as Edgar Allen Poe? The re-imagining part was fun. The part that I don’t particularly look forward to are the different opinions on how well I did! While I did take on Poe’s world, I tried to make it my own and create my own characters. Sure, there’s always intimidation, because Poe was a genius, but I really never tried to compare my work to his, I just used his as inspiration. Which other authors inspire you? Wow, I’m inspired by so many authors, I love to read much more than I love to write. I’m inspired by Stephen King, and by Sylvia Plath’s poetry, and by Anne Rice, and by Tolkien, I’m mostly listing authors I read as a kid because there are so many contemporary books that I enjoy, but I’d consider the ones I read years ago as the most inspiring, the books I’ve read in the last few years were pleasure reading. Did you have a soundtrack for writing MASQUE OF THE RED DEATH? What was on it? MASQUE OF THE RED DEATH is the first in a duology. Can you tell us a little bit about what’s to come in the next book? A Masquerade ball? Some romance, some treachery, and lots more dead bodies? Is there a trick you fall for every time? I don’t know, I don’t think I deal very well with tricks. I overthink things and end up irritated of baffled. Which of your characters would be the most difficult to prank? Thanks very much for taking part in our event, Bethany! We’re looking forward to MASQUE OF THE RED DEATH! Nights in the Debauchery Club, beautiful dresses, glittery makeup...and tantalizing ways to forget it all. We have two different giveaways today! They have different mailing restrictions so please read the instructions below carefully. Giveaway #1: Bethany is offering a lovely giveaway: three (3) bookmark + leather bracelet sets for our readers! Note: Bookmark may not be exactly like this one and you only get one (1) bracelet (your choice of colour). 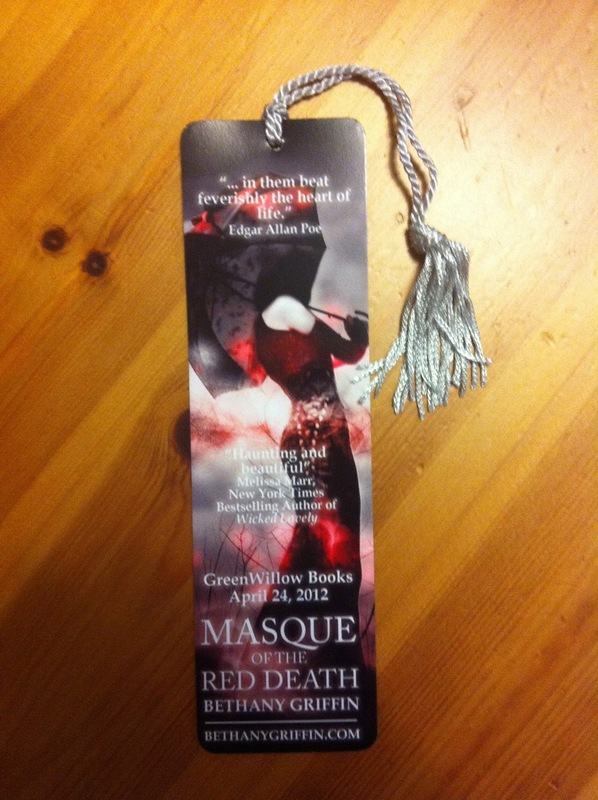 Giveaway #2: The kind folks at HarperCollins are offering one (1) copy of MASQUE OF THE RED DEATH to a lucky reader! To enter the giveaways, fill out the Rafflecopter form below. 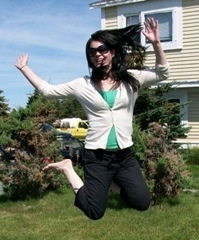 Bethany Griffin teaches high school English and creative writing outside Louisville, Kentucky. She loves Poe, and creepy stories in general. Masque of the Red Death is her second published novel, but the first could be considered Speculative History, Dystopian, Steampunk, or whatever else you'd like to call Masque. She has two well-behaved children and 5 poorly-behaved cats. I love seeing remakes of my favorite fairy tales. Loved them as a kid and enjoy a twist on them as an adult. Thank you for a chance to win a copy. I love seeing the newest fairy tales TV Shows (Once Upon A Time) & movies (The Huntsman) coming out soon on the big screen. SQUEEEEE! I would LOVE to redo an Alice in Wonderland type story. So many options and twists possible. I would re-imagine Snow White, although I guess the films coming out recently have done that for me! I would re-imagine all the fairy tales. I would change it to a dark dystopian type theme. I would re-imagine the story of the Viking gods Thor and Loki and have some fun with it. Loki always gets such a bad rap, I'd have him be the hero. Persephone and Hades. I love that legend. It would be fabulous on screen. I'd like to re-imagine The Three Bears. Of course, the bears would be men! Some of Aesop's Fables would be good updated. Thanks!! I'd re-imagine Poe's The Raven! I think it would be so cool! I so love the cover of this book, and winning a bookmark is something I really enjoy. A book rewritten, wow. Are there any books left to re-write? Perhaps Jane Eyre, less dark, more romance? I like seeing fairy tales reimagined. Thank you for the giveaway. I would re-imagine The Wizard of Oz. Thanks for the giveaway! I would re-do the Little Mermaid. I can't believe someone hasn't done it yet! I love all the fairy tale retellings. They've been doing a lot with Snow White which is awesome. I'd love to see more done with Cinderella. I know this is going to sound insane but, I'd love to see a re-imagining of Mary Poppins. It was one of my faves growing up. I love all of the fairy tale retellings and would love to see Aladin ,Beauty and The Beast, Little Red Riding Hood,and chitty chity bang bang retold . I'd reimagine Beautty and the Beast. I think it would be cool to retell Rip VanWinkle's story. Have him wake up in a world filled with paranormals. I'd reinmagine The Little Mermaid! Thanks for the interview and giveaway! I love retellings of Cinderella. Even though it's a little overused, I'd probably do a retelling of it because it seems like there's so many ways to go with it. I would like all the fairy tales re told. I am really enjoying the twists they are being given in Grimm and Once Upon A Time. Thanks for the chance. I love both Once Upon A Time and Grimm for retelling the fairy tales and also adding their own fun twists on the stories. I have been reading books based off the Greek myths and I would love to see Cupid and Psche's story as a show or movie. That would be so great to see. Thank you for this awesome giveaway. I would love to see Thumbelina redone. This is hard because so many have been re-imagined, from fairy tales to Jane Austen and Charlotte Bronte to Shakespeare and mythological stories. I guess I wouldn't mind reading more Jane Austen or Shakespeare (the comedies) retellings. Maybe someone could do something cool with Mark Twain as well. I'd like to see a retelling of Taming of the Shrew, but I agree with a lot of others and say I also love fairy tales retold (happy Disney versions, not creepy, scary Grimm ones). I would love to re-imagine Cinderella. It was always one of my favorites. I would re-imagine The Little Mermaid! I love that story so much (the happy, Disney version that is--though the original is pretty great as well) and would love to put a different twist on it. I would love to re-imagine Alice's Adventures in Wonderland. Thank you for the giveaway. I'd re-imagine Frankenstein/ Pinocchio, as a dark YA paranormal adventure. Something tells me there'd be a lot of dead bodies. net so from now I am using net for articles, thanks to web.